MCC FoundationPress ReleaseMCC ConCom is a big success, helps students, brings community together! It was a big, sunny festival of connections. Mohave Accelerated Learning and Mohave High School students reviewing the MCC ConCom map and event schedules. The first MCC ConCom event on the Bullhead City campus of Mohave Community College was designed to connect the community. Its primary purpose was to invite community members to the campus to see what MCC has to offer, but it actually was much more than that. Therefore, part of the event was dedicated to a job fair run by Goodwill of Central & Northern Arizona. The job fair drew employers that included Dimond and Sons, the Bullhead City Police Department and Thrive Skilled Pediatric Care, which is opening a Kingman branch on Monday. Thrive’s assistant director of nursing, Stacie Addy, said the company is trying to recruit nurses. MCC Student Activities Council handed out free nachos and popcorn and gave out prizes at the ConCom prize wheel. Other employers talked to MCC and high school students about part-time and student jobs. Jennie Dixon, MCC’s human resources director, talked to visitors at her booth about a new job board at the college that focuses on local openings and local candidates. 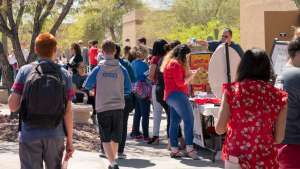 Arizona Job Connection also was on hand to provide help in areas that included resume writing and to discuss jobs programs for youths, disabled veterans and other groups. The event was also a showcase for various MCC programs, including chemistry, culinary arts and nursing. Interactive MCC booths let visitors decorate their own cupcakes and perform virtual surgery, among other tasks. 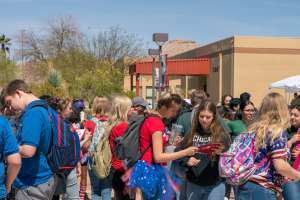 Chloe Summers, a high-school student from Kingman, said she took the day off to explore ConCom. She was impressed, though she’s unsure what she’ll do after graduation. Mohave Accelerated Learning Center sophomores Audrey Gee and Leila Flores said they enjoyed talking to MCC representatives about programs and to employers about jobs that might suit them. Read more about this event in the Mohave Valley Daily News.